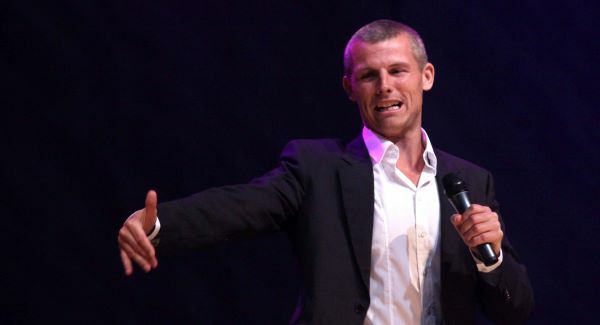 Des Bishop: Made In China seems like an odd show title for a comedian born in New York and educated in Ireland – until Bishop explains that he has spent the last 18 months living, performing, working and learning in China with an adoptive Chinese family. Following his show spoken entirely in Gaelic (opening him to a new audience of merely 60.000), Bishop decided to head for bigger territory and learn a new language spoken by 1.3bn people instead. Assisted by a chinese friend, Bishop visited China and learned a few useful phrases, before taking a full course and becoming fluent in Mandarin. He planned to stay for a year and learn enough Mandarin to perform a one-hour standup show, but became so engrossed in the culture and lifestyle that he stayed an extra 6 months before coming home to tell his western audiences about it. Bounding onstage to Jump Around, which he then proceeds to sing in Mandarin, Bishop introduces himself first to the small Chinese contingent of the audience, cross-translating their conversation as he goes. He then seeks out the Irish, the Scottish, and the English in the room, taking great care to deride each individually. This is a theme throughout the show, as he pokes fun (chiefly at the Irish) of the various cultures he has grown up with – including, of course, the Chinese. Bishop clearly has a deep knowledge and love of Chinese culture, as he pulls no punches in insulting various aspects of Chinese life (including *that* accent), to roaring applause from its compatriots. Quite unlike many shows at this (or any) year’s Fringe festival, Made In China is educational and eye-opening, and includes a small lesson on the structure of Mandarin, in which we are told that Des Bishop’s given surname Bi, is extremely offensive when spoken with a subtle inflection – learnt the hard way by Bishop himself. Further than that, the combination of PowerPoint lesson, comedy routine, and VT footage from his Breaking China documentary, opens western eyes to the complete lack of free speech in China – from an hour long show Bishop was forced to cut 50% of his material, in order to do a simple club gig in front of a small, like-minded audience. Obviously this causes a problem for the emerging Chinese comedy scene, of which Bishop had become a part. There are also lessons in dating, marriage, TV shows, daily life, and dying musical artforms in China. Des Bishop smashes numerous stereotypes, and confirms a few more within the hour-long show, leaving the audience educated, informed, and most of all – deeply entertained.